Emil Jannings (23 July 1884 – 2 January 1950) was a German actor, popular in 1920s Hollywood. He was the first Oscar recipient, honored with the Academy Award for Best Actor at the 1929 ceremony. To date, he is still the only German to have won the Best Actor Oscar. Jannings is best known for his collaborations with F.W. Murnau and Josef von Sternberg, including 1930's The Blue Angel, with Marlene Dietrich. Der blaue Engel was meant as a vehicle for Jannings to score a place for himself in the new medium of sound film, but Dietrich stole the show. Jannings later starred in a number of Nazi propaganda films, which made him unemployable as an actor after the fall of the Third Reich. In 1960, Jannings was honored with a star on the Hollywood Walk of Fame at 1630 Vine Street for his contribution to motion pictures, making him one of fewer than a hundred Oscar-winning male actors in Hollywood history to receive a star. He was christened Theodor Friedrich Emil Janenz in Rorschach, Switzerland, the son of Emil Janenz, an American businessman from St. Louis, and his wife Margarethe (née Schwabe), originally from Germany. Jannings held German citizenship; while he was still young the family moved to Leipzig in the German Empire and further to Görlitz after the early death of his father. Jannings ran away from school and went to sea. When he returned to Görlitz, his mother finally allowed him to begin a traineeship at the town state theatre, where Jannings started his stage career. From 1901 onwards he worked with several theatre companies in Bremen, Nuremberg, Leipzig, Königsberg, and Glogau before joining the Deutsches Theater ensemble under director Max Reinhardt in Berlin. 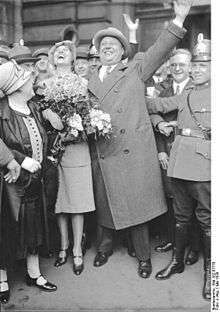 Permanently employed since 1915, Jannings met with playwright Karl Vollmöller, fellow actor Ernst Lubitsch, and photographer Frieda Riess, who after World War I all were at the heart of the Weimar Culture in 1920s Berlin. Jannings made his breakthrough in 1918 with his role as Judge Adam in Kleist's Broken Jug at the Schauspielhaus. Jannings was a theater actor who went into films, though he remained dissatisfied with the limited expressive possibilities in the silent era. Having signed a contract with the UFA production company, he starred in Die Augen der Mumie Ma (The Eyes of the Mummy, 1918) and Madame DuBarry (1919), both with Pola Negri in the main female part. He also performed in the 1922 film version of Othello and in F. W. Murnau's The Last Laugh (Der Letzte Mann, 1924), as a proud but aged hotel doorman who is demoted to a restroom attendant. Jannings worked with Murnau on two other films, playing the title character in Herr Tartüff (1925), and as Mephistopheles in Faust (1926). His increasing popularity enabled Jannings to sign an agreement with Paramount Pictures and eventually follow his acting colleagues Lubitsch and Negri to Hollywood. He started his career in 1927 with The Way of All Flesh directed by Victor Fleming (now lost) and in the following year performed in Josef von Sternberg's The Last Command. In 1929 Jannings won the first Best Actor Oscar for his work in both films. He and Sternberg also cooperated in Street of Sin (1928), though they actually differed about Jannings' acting in front of the camera. His Hollywood career came to an end with the advent of talkies as his thick German accent was difficult to understand. His dialogue was initially dubbed by another actor in the part-talkie The Patriot (1928) directed by Ernst Lubitsch, although Jannings' own voice was restored after he objected. Returning to Europe, he starred opposite Marlene Dietrich in the 1930 film The Blue Angel, which was filmed simultaneously in English with its German version Der blaue Engel. Ironically, in the same period Dietrich would become a US citizen and an influential anti-Nazi activist, spending much of the war entertaining troops on the front lines and broadcasting on behalf of the OSS. Dietrich particularly loathed Jannings for his Nazi ties, and would later refer to her former co-star as a "ham". Jannings retired to Strobl near Salzburg, Austria, and became an Austrian citizen in 1947. He died in 1950, aged 65, from liver cancer. He is buried in the St. Wolfgang cemetery. His Best Actor Oscar is now on display at the Berlin Filmmuseum. Jannings was married three times. All three marriages were to stage and film actresses and all three ended in divorce. His first marriage was to Hanna Ralph, his second to Lucie Höflich, and his final marriage was to Gussy Holl. Hilmar Eichhorn portrayed a fictional, but not sanitized, version of Jannings in Inglourious Basterds, directed by Quentin Tarantino. In the 1972 film Cabaret, singer Sally Bowles (Liza Minnelli) finds herself at a high-society dinner party; she tries to impress someone at the table by suggesting that she is a friend of Emil Jannings. 1945 Wo ist Herr Belling? Firmenchef Eberhard Belling a.k.a. Where Is Mr. Belling? ↑ "Walk of Fame Stars-Emil Jannings". Hollywood Chamber of Commerce/Walk of Fame. 1 2 3 4 5 "Herr Emil Jannings A Great Film Actor". Obituaries. The Times (51580). London. 4 January 1950. col E, p. 7. ↑ "Throw Rin Tin Tin A Bone & Give Back The Pooch's Best Actor Oscar", deadline.com; January 2012. ↑ Welch, David (2001). Propaganda and the German Cinema, 1933-1945. I.B.Tauris. p. 117. ISBN 9781860645204. Retrieved 11 November 2016. ↑ Chroniknet.de, Obituary for Emil Jannings (2 January 1950), chroniknet.de]; accessed 26 October 2014. Wikimedia Commons has media related to Emil Jannings.